What if Business (or ALL Interactions) Ended With Hugs Instead of Handshakes? According to some, the origin of the handshake was thought to be a gesture of peace by demonstrating that you held no weapons. (Of course, this presupposes that everyone is right-handed, but that’s a story for a different post.) When you think about the handshake in that sense, it’s actually kind of nice, isn’t it? There’s really a lot that could be said about the evolution of the handshake. We could talk about the different cross-cultural rituals that take the place of handshaking. For instance, in east-Asian cultures, bowing is the norm when it comes to social interactions. However, with the prevalence of globalization, there are now many instances where east-Asians and non-east-Asians will be engaged in some sort crossed bow and handshake. 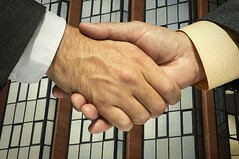 We could even discuss some of the modern customs or variations of the handshake. For instance, Wikipedia lists 6 different kinds of handshakes (hand hug, dominance, cold and clammy, crusher, queens fingertips, and keep back), some of which you could probably figure out the gist of just from the name. Wikipedia also lists a number of modern customs spanning African-American culture to Arabic-speaking people and even for non-business situations in Turkey. So, as I said, there’s so much information simply from a historical or anthropological point of view. I’m more interested in what it might look like to substitute a hug for the handshake. I’m sure I’m not the first person to imagine this possibility, (and a quick internet search even turns up results in Psychology Today and Time on the topic of hugs and handshakes), but I think I have a unique perspective on the matter. Historically, as discussed above, the handshake was meant to show that there wasn’t a weapon in one’s hand. If we look at the Gestalt of the act of the handshake (including both participants), there isn’t often an opening, specifically with regard to the heart area. If you think about when you shake someone’s hand, this is usually what happens (or some degree of variations thereof): one of the two participants (in the handshake) will stretch thereby shifting their torso out on an angle to the left (can you visualize it?) And the other person, the person who receives the handshake, has their elbow a little closer to their stomach and their hand is usually out in front of themselves (more towards the center). Take a second and picture this in your mind. The person receiving the outstretched hand, in a way, is closing off their heart area by way of their arm/bicep. Now, I don’t think that either side of this equation is consciously or intentionally shifting their heart away from the action, I just think that this is how the ritual has developed over time. So instead, what if we hugged? I know, I know, this might not work across all cultures. And then you’d probably raise the issue that some people don’t feel comfortable being that ‘intimate’ with strangers. Some are even saying that our culture is killing off the hug. Okay, but how did the handshake start? By showing the other person that you weren’t carrying a weapon. Maybe a global movement to replace the handshake with the hug could be a way to promote more compassion and empathy for each other. One things for sure, we could all use a bit more oxytocin in our systems (through natural means).